The large project on Meetinghouse Way has raised numerous concerns among residents and conservation groups. Edgartown residents have made themselves clear — a large housing development will have a negative impact on the Island. The 54-acre, 34-lot subdivision, located between Meetinghouse Way and Meshacket Road, began its public hearing in front of the Martha’s Vineyard Commission (MVC) Thursday night. 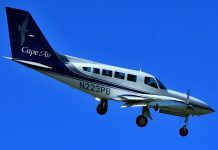 The project — one of the largest the MVC has reviewed — received intense scrutiny and severe pushback from several Edgartown residents, stakeholders, and conservationists, who were concerned with the project’s potential impact on traffic conditions, Island urbanization, nitrogen loading, and animal habitat loss. Developers Douglas K. Anderson and Richard G. Matthews, operating as Meeting House Way LLC, purchased the property in June 2017 for $6.6 million. Both have listed addresses in Salt Lake City, Utah. There was little space to move in the crowded MVC meeting room as attorney Sean Murphy and agent Doug Hoehn fielded questions and comments from the commission and the public. DRI coordinator Paul Foley gave a brief presentation on the property, which included drone footage showing the mostly forested area. The project proposes to create 34 lots ranging in size from 1 to 2.68 acres. The proposed houses have several restrictions, such as limiting the square footage to 5,000 square feet of living space, which includes a garage with a bedroom on top and a 900-square-foot “unconditioned space for gathering” limit, according to the commission staff report. A portion of the property will be deed-restricted through a conservation and management permit for imperial moth habitat that resides along 16.72 acres of the eastern and southern edges of the property. Several commissioners opened the hearing by disclosing their apparent conflicts of interest. Commissioner Joan Malkin said she wanted the public to be aware she is the vice president of the Vineyard Conservation Society (VCS), which has filed testimony against the subdivision project. Malkin has recused herself from VCS discussion concerning the project, and has filed a disclosure form with Chilmark, the town that appointed her. Chairman Douglas Sederholm said his law partner, Howard Miller, represented Meeting House LLC in purchasing the property, and may have offered them an opinion about access issues. Miller no longer represents Meeting House LLC, but Sederholm wanted the public to be aware of it. Commissioner Jim Vercruysse disclosed he is a board member of the Sheriff’s Meadow Foundation. Meeting House LLC requested the foundation hold a conservation restriction on the imperial moth population on the property. Vercruysse recused himself from any talks between the Sheriff’s Meadow and Meeting House LLC. Commissioner Christina Brown, who is also a member of the Edgartown affordable housing committee (AHC), said she has filed disclosures with every town clerk, and has spoken to the ethics commission. Edgartown has been contemplating building affordable housing lots on land that abuts the Meeting House LLC property. Brown said she has also recused herself from discussions of the property during Edgartown affordable housing committee meetings. “Anybody else want to bare their souls?” Richard Toole, who led the hearing as the land use planning committee chairman, joked. Despite the disclosures, the commissioners said there were no conflicts that would hinder their abilities to vote. Nitrogen loading was of particular concern for the project. The property sits in the Edgartown Great Pond watershed. Too much nitrogen from fertilizers and septic systems create algal blooms in Island estuaries, killing plant and animal life. “It is recovering, but it’s not great,” Sheri Caseau, MVC water resources planner, said of the watershed. The MVC’s nitrogen load limit is 1.40 kg per acre per year, or 76.08 kg per year for the property. Caseau estimated the proposed development would have a significant nitrogen load of 138.96 kg per year, far exceeding the MVC limit. The proposed development would be hooked up to the town sewer, which would add even more nitrogen loading, totaling 235.71 kg per year. Pio Lombardo, a nitrogen management consultant, created a nitrogen management plan for the project and told commissioners he believes the nitrogen loading can be brought down to 25 to 48 percent of the MVC’s limit by limiting nitrogen fertilizer, creating landscape plans to minimize nitrogen use, and using a permeable reactive barrier (PRB). PRBs are underground barriers made of wood chips and oil that attract nitrogen molecules and catch them. Sederholm asked Caseau if she would like an independent environmental consultant assisting her as she evaluated the nitrogen management plan. The commission then voted to hire a consultant to assist Caseau at the expense of Meeting House Way LLC. The project has undergone several revisions since first proposed, most notably to its affordable housing contributions and its conservation restrictions. Murphy informed commissioners of his client’s intent to offer $1.1 million toward affordable housing as part of the MVC’s affordable housing policy, which requires either 20 percent of the assessed value of a property or 10 percent of the buildable lots in the subdivision go toward meeting the needs of low- and moderate-income residents’ housing needs. The affordable housing committee submitted a letter to Meeting House Way LLC indicating they would prefer lots rather than money. $490,000 of the offer would be paid in three installments, plus $18,300 per lot, totaling $622,200. Meeting House Way LLC will also run electrical and wastewater lines to the Edgartown affordable housing project, which abuts the subdivision. Additionally, any future sale of a lot will require a 1 percent transfer fee — paid by the seller — to go to the Dukes County Regional Housing Authority or whichever group the MVC decides. “If this happened back in the ’70s or ’80s, there would be a massive housing bank now. A very creative solution by [Meeting House Way LLC] that’s a long-term, perpetual funding mechanism,” Murphy said. In April 2017, the MassWildlife Natural Heritage and Endangered Species Program submitted an environmental notification form that an imperial moth habitat was found in the vicinity of the property. The moth is a state-listed rare species. Luanne Johnson, a wildlife biologist and director of BiodiversityWorks, said that in addition to the imperial moths, northern long-eared bats would also be negatively affected by the project. “If the nitrogen concerns aren’t enough to make you deny this, if the traffic concerns aren’t enough to make you deny this, if the housing issues, the urbanization, the homogenization of the whole Island isn’t enough to make you deny this proposal … I ask you to think of the wildlife that have lost everything on this Island,” Johnson said. Along with Johnson, several other members of the public voiced their concerns about the project. David Nash said the exit and entrance at Meshacket Road “boggles his mind,” and that he opposes the project. Paul Adler told commissioners he had a long history with the property, and was friends with the former owner. Adler had worked with the former owner, and tried to sell the property to the Martha’s Vineyard Land Bank, which turned him down twice. The commission also reviewed several correspondences prior to the hearing. In a letter to the commission, the executive director of VCS, Brendan O’Neill, asked the commission to deny the project, citing a wide range of issues. 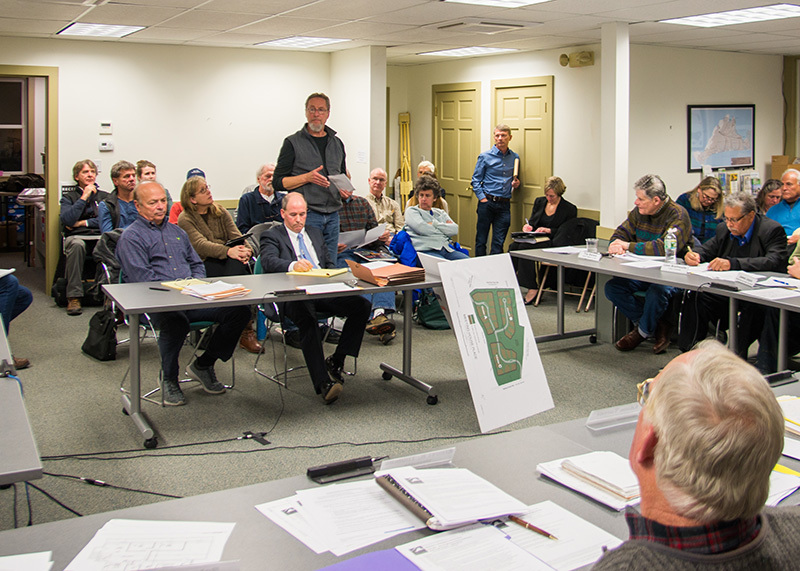 Jim Athearn, owner of Morning Glory Farm in Edgartown, was met with applause after he gave a speech on how this subdivision was one of many subdivisions in town that bring in more people and more traffic to the Island. After two hours of questions and comments, commissioners decided to continue the public hearing to March 7. Updated to include more details from the meeting. -Ed. Just what the island needs. 35 more trophy homes using excessive energy all year with 2 months occupancy. I got a good laugh when I read that the owner of the “Morning Glory” Supermarket made a remark about traffic. That establishment creates more traffic than any other establishment on that busy corner I’d guarantee 34 seasonal homes would generate less traffic in a day than ‘the farmstand’ does in 15 minutes in July. With respect to concerns about ‘nitrogen loading’ in the pond: Edgartown wastewater plant should stop accepting septage pumpouts from other towns. Or reduce the amount accepted in order to accommodate the TAXPAYERS of this land, rather than SUBSIDIZING these other towns who chose not to address their own wastewater issues. There is no doubt that the light wastewater flow from 34 seasonal homes versus the concentrated septage from OTHER towns would reduce nitrogen loading in the pond. “IF” the plant needs a certain amount of septage off-season to keep functioning, then Edgartown taxpayers/property owners should be encouraged to do off season ‘maintenance pumpouts’ at a lower rate. And the out-of-town septage should be a charged a lot more since their taxpayers don’t fund the plant. This is the best example of why MV will never deal with its housing shortage. They care more about nitrogen than they do about people. MV can sustain many more people and everyone knows it. I’m interested in who this “everyone” is. Could you please go one single post without resorting to gross hyperbole without a single fact to back it up? Some may think the jobs a new development creates is an Irlsnd benefit. The other side is those that live here can not get a trade person at a reasonable price as they are all working on trophy homes for high pay.